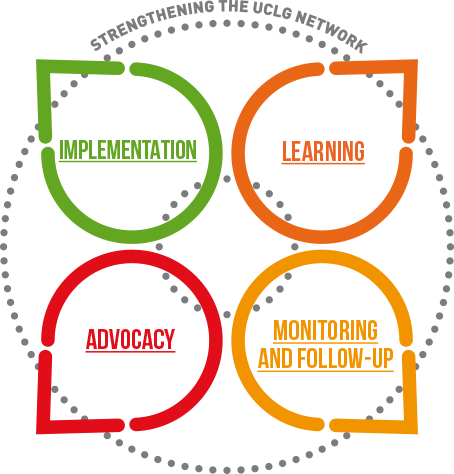 UCLG believes in the power of networks, in the multiplier effect of synchronizing thousands of local and regional actions at global level. Across the world, local and regional governments are working to advocate for change, implement the global agendas, learn from one another, and track their progress towards the achievement of the global goals. It is UCLG’s mission to showcase and multiply the impact of this work through “Waves of Action” by our members and partners. What are UCLG Waves of Action? In the spirit of focusing on the implementation of the global agendas and of amplifying the work of the network, UCLG organize actions in the form of Waves of Action. Advocacy: UCLG will continue to defend the right to housing in the framework of the Right to the City at global level, as expressed in the Bogotá Commitment adopted in October 2016. We will promote debates on housing among our members to build a common narrative and strategy to influnce the discussions of the High Level Political Forum (HLPF) on the implementation of the Sustainable Development Goal (SDG) 11. Learning: A learning session on financing housing: the Committee on Finance and the CSIPDHR together with UCLG Learning team will organize a peer-learning session on financing affordable housing at local level. UCLG is also actively involved in “Make the Shift”, a movement we led by the UN Special Rapporteur on the Right to Adequate Housing, Leilani Farha, in partnership with the UN Office of the High Commissioner for Human Rights. Make The Shift seeks to mobilize a large range of actors at worldwide level to push for housing to be seen as a human right and a social good, rather than as a commodity. Monitoring: The next Gold Report (GOLD V) will focus on the way local governments contribute to the achievement of SDGs. One of the chapters, in the framework of SDG 11, will focus on the role of local governments in housing policies and on the enabling environment required to allow local governments meet the needs of people, especially the poorest, in terms of housing. Advocacy: The governance of migration and the inclusion of newcomers in cities are topics that UCLG links to sustainable urban development and planning, because today’s migrants are the citizens of tomorrow. This approach is part of UCLG's mission to promote the right to the city, access to basic services, guarantee of human rights and participation processes. The implementation of this approach requires, on the one hand a change in the narrative on migration at local level, by promoting and highlighting the inherent opportunities to sound policies on the inclusion of migrants and, on the other hand, a better multi-level coordination and strengthening capacities and local resources. In this context the global policy will build on positions and experiences from different parts of our network particularly, CEMR, Metropolis, UCLG-MEWA and UCLG-Africa. UCLG will bring these messages to the framework of the Global Compact on Migration, a process of intergovernmental consultations and negotiations to provide a framework to protect human rights of migrants. Learning: The Mediterranean City to City Migration project (MC2CM) was a laboratory where 7 peer learning sessions have been hold on issues related to governance of migration and inclusion of newcomers at local level. This work will continue during the second phase of the project, by including more cities from the Mediterranean basin and sub-Saharan Africa, as well as national associations of local governments, as agent of knowledge and practices capitalisation and transfer. UCLG will also continue the work beyond the Mediterranean to replicate and extend focus on migration to other parts of the world with the support of the regional sections, the committees and the international partners. Implementation: As part of the MC2CM project, UCLG accompanied the implementation of pilot projects, building the capacity of local authorities to deal with migration realities and the inclusion of migrants. The second phase of the project will continue this implementation at the local level. UCLG will continue to promote the action of its members, in relation to the implementation of the SDGs, the inclusion of migrants directly contributing to the achievement of many sustainable development goals for inclusive, safe and resilient cities. Monitoring and evaluation: The second phase of the MC2CM project, which will be launched in 2018, will make possible to evaluate and monitor the actions implemented by cities in terms of governance of migration and inclusion of migrants.